Sale Sharks professional premiership rugby team take to the water in an unconventional pre-season training weekend. 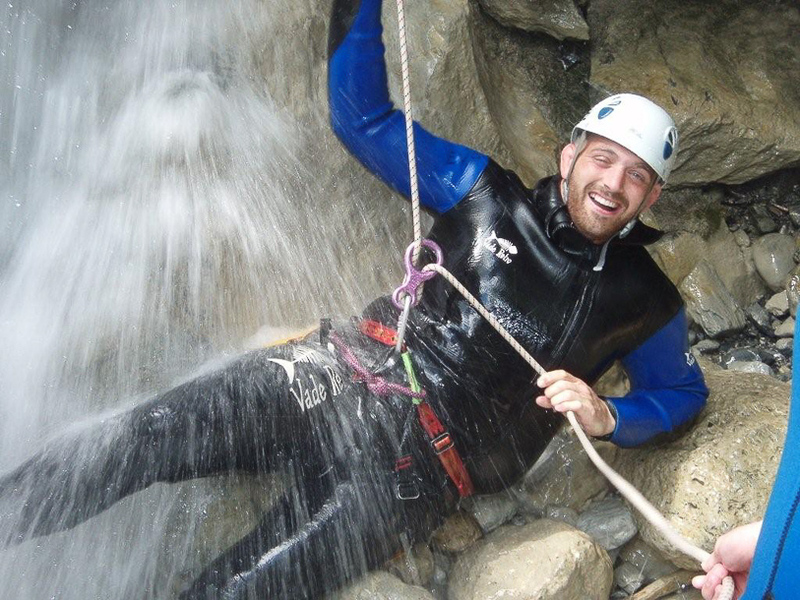 Check out our photo album of the Sale Sharks Canyoning including Ben Cohen and other rugby stars. 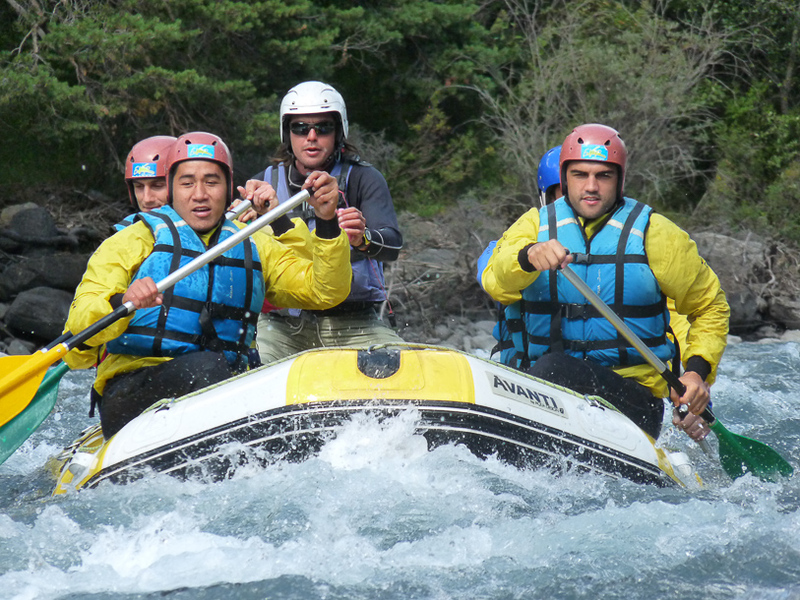 Thinking out of the box, Sharks head coach, Mike Brewer decided to make the most of the Sharks friendly in Clermont, France and arranged to stop off in the Alps on the way home for an extreme sports weekend of canyoning and white water rafting with Undiscovered Mountains. The Shark’s adventure started on Saturday evening when they arrived in Ancelle to stay in a no frills 2 star hotel, the Chalet Igloo where much work was done to try and find beds big enough for our rugby boys! 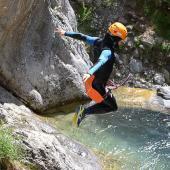 On Sunday morning after an early breakfast they were split in to two teams of 17 and transported off to Le Blache canyon and the Ubaye river for their first taste of alpine adrenalin! In the canyon the sharks were presented with 25 meter waterfalls to abseil down. With their lives firmly held in their hands as they held their own weight (all 120 kilos of it in some cases! 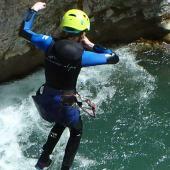 ), they abseiled down the falls – one after the other! 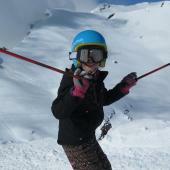 A vertical challenge that not all were that comfortable with! Leck and McIntyre overcame their fear of heights and shaky legs with much encouragement from their teams and persuasion from the guides! Croall and Cohen went back for second helpings, Croall totally in his element with his head under the water! For big guys used to having their feet firmly on the pitch and only the scrum to negotiate, rocks, cliffs and waterfalls made for an unusual challenge! On the river, the teams were split into three rafts and the challenge was to try and keep them afloat (no mean feat when the average weight in each raft was over 600kg!) and navigate their way down the rapids without too many collisions. The reality was a full out battle between the three rafts with no-one actually winning but everyone getting very wet! The guides were exhausted at the end of the day after hauling 34 big rugger boys back into the rafts several times! All in all the weekend was a success and the Sharks left with a suntan, some great memories and challenges conquered.